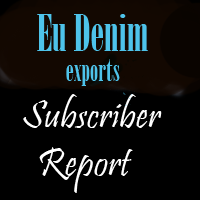 EU denim production capacity has been reducing constantly and due to increased costs of production and the resultant shifts of productions to Asia . The shifting of denim fabric production to Asia has also been increasingly supported by increased apparel production in Asian and other countries. As a result EU denim mills have to increasingly ship their fabrics overseas for conversion- which in any case they were doing to countries like Tunisia and Morocco. More countries have been added to this list and the fabrics are now being shipped across Asia . a) The countries where the major shipments are being made. b)The quantities shipped to these countries .It gives an idea as to which countries are importing more of EU fabrics. c)The value and average prices of these fabrics. e)Countries covered are Tunisia, Morocco, USA, Turkey, India, Egypt , China and Hong Kong. f)Total EU export during this period of 2 years. This report is available to our Special Reports Subscribers.